This morning I was handed a small vial of water from the deepest reaches of the Tasman Sea (4800 meters deep, to be exact). So what, you ask? Well, this water has not seen the light of day for about 600 years. That’s right, 600 years ago this water became very cold, salty, and dense, gradually sank to the bottom of the ocean in either the North Atlantic or the Southern Ocean and has not been in contact with Earth’s atmosphere since. These water samples were collected by Pete Strutton on our last CTD profile – the Niskin bottles on the CTD were opened at 4800 meters and the cold, salty water poured in. We’ve previously mentioned Pete’s work on nutrients in surface waters and the effect on phytoplankton. In this case, he wanted to be able to compare the abundance of those nutrients at the surface with the very deepest water in the Tasman Sea (which would tell him a bit of how much the deep nutrients are getting mixed into the upper layers). 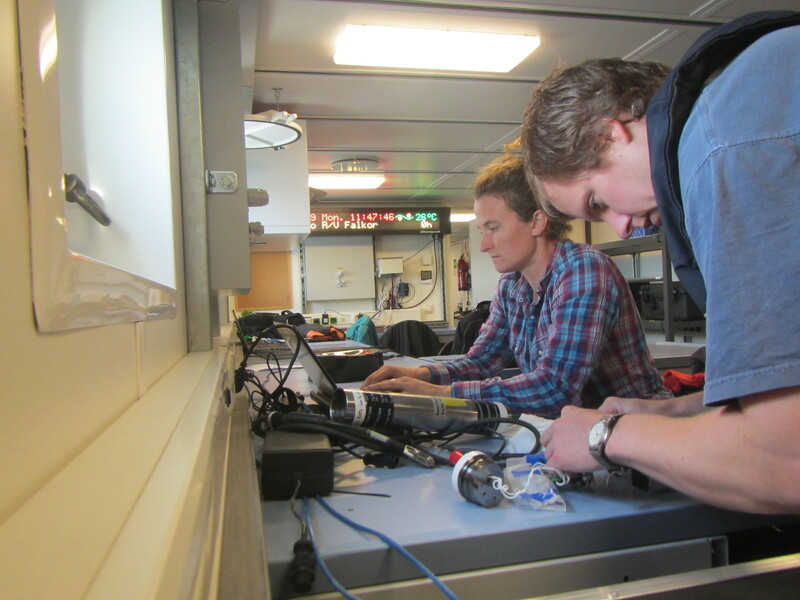 Back at the surface, Danielle Mitchell partitioned the samples out into vials as souvenirs for everyone on board. Our retrieval of this deep ocean water gives me the opportunity to talk about the important role of deep water circulation around the globe and the water cycle. 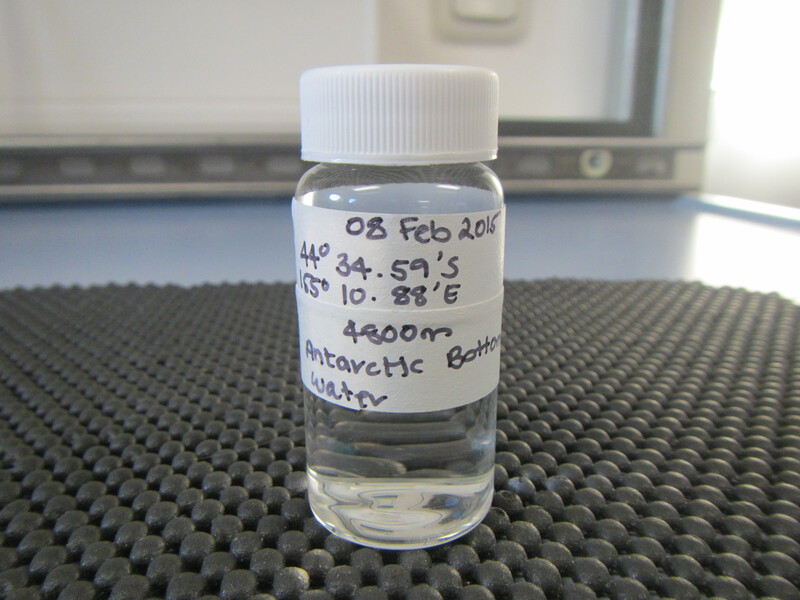 The water that we brought up in our samples actually has a 50% chance of being either from the North Atlantic or the Southern Ocean (Matsumoto, 2007). These two areas are responsible for creating the large masses of deep ocean water because the surface water in these areas becomes very, very cold. Water becomes more dense as it cools and therefore it starts to sink. In addition, the surface seawater may even freeze (especially in the Antarctic) and as it does, the dissolved salts precipitate out, making the seawater below even more salty, and dense. 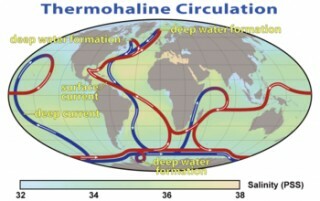 The sinking water masses, called “North Atlantic Deep Water” and “Antarctic Bottom Water”, initiate a deep ocean circulation pattern (called thermohaline circulation) that carries water from these two regions towards the equator where wind-driven upwelling brings it to the surface, gets warmed again, some of which is evaporated into the atmosphere, becomes clouds, and rains back down into the ocean again in higher latitudes. Surface waters are entrained in large ocean gyres that move in a cyclonic fashion around the ocean basins in the northern and southern hemispheres. A familiar characteristic of the deep ocean is the immense pressure, due to the thousands of meters of water pressing down from above. 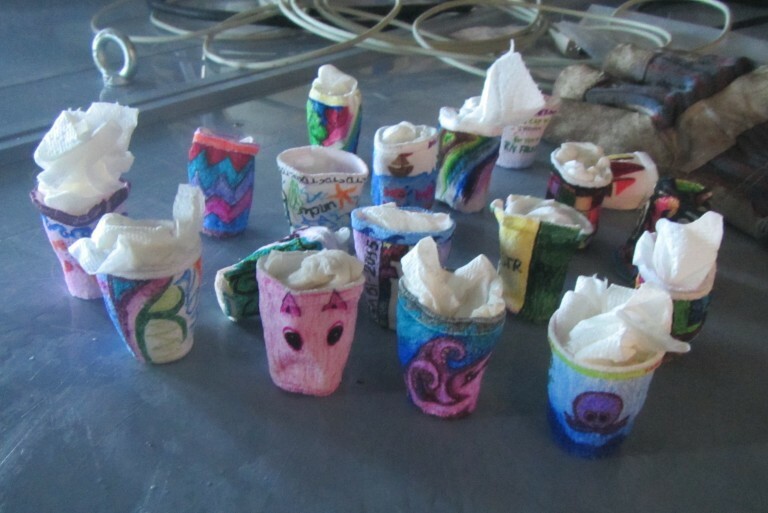 Students at Salmon Bay school in Seattle, WA will get a first hand demonstration of this pressure when the Styrofoam cups they decorated come back to them after being taken down to 4000 meters in a mesh bag attached to the CTD. But what is ecologically important about the deep ocean is its storage capacity. In addition to nutrient storage covered in a previous blog, the deep ocean can store a large amount of heat and carbon. It is this storage of carbon, as dissolved CO2, that gives scientists the ability to know how long the water we collected on our CTD is about 600 years old. The earth’s atmosphere has a very small amount of naturally occurring 14C, also called radiocarbon. 14C is an unstable form of carbon and undergoes radioactive “decay” (one of its neutrons becomes a proton and the molecule becomes a stable nitrogen atom, 14N). This decay happens at a very predictable and measurable rate. There is no source of 14C in the ocean, so all of the 14C in the ocean has come from the atmosphere. Once 14CO2 is dissolved in seawater, any decay of the 14C can only be replaced by new 14C if the water remains in contact with the atmosphere. So radiocarbon dating can tell us how long it has been since a particular sample of deep ocean water has been at the surface. And that can give us an estimation of how long it takes for water to move through the “conveyor belt” of global thermohaline circulation. From one small atom to a big picture of how the ocean affects Earth’s climate – science is pretty amazing.